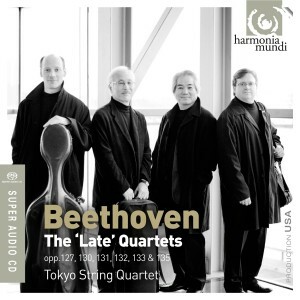 The Tokyo's recording of Beethoven's 'Late' Quartets, released October 12, 2010, rounds out their acclaimed Beethoven cycle with the composer's most transcendent string quartets. Awarded 'Diapason d'Or' by French critics for the most outstanding classical recording in November. Awarded International Record Review's "OUTSTANDING" in November's issue. "The stylistic versatility of the Tokyo Quartet's performances brings out the humanity and humour as much as the starkness of these seminal works...the range of colour (including a Grosse Fuge that balances fire with equanimity) makes this a fine release, which I endorse wholeheartedly." You can’t go wrong with this set. The ‘Late’ String Quartets is a superbly engineered recording of the greatest string quartets ever written, played by one of the world’s finest ensembles...The sound itself....is magnificent, vast yet intimate, missing any extraneous noise, with nary a grunt or even a breath from the musicians. What about the playing? There’s never a hint of a strained or wrong note throughout. It’s all exquisite interpretation, the likes of which I haven’t heard since the recordings of the Emerson String Quartet (1998), the live recordings of the Alban Berg Quartet studio (1987) and live (1993), or even the Julliard String Quartet in their Grammy-winning set (1985). "This is not the first time the Tokyo String Quartet have committed Beethoven's late works to disc, but it is the first time with the current line-up and, more significantly, is the first time on SACD. The results are both precise and passionate, with each quartet given a impassioned and intense reading. It is absorbing stuff, drawing the ear into the bizarre microcosm of each work, but the performers don't labour the strangeness of the music, opting instead for an approach driven by melody. This allows them to create impressive coherence within and between movements, even with tempos that are often on the slow side...The sheer integrity of the interpretation makes comparisons with other recordings seem almost redundant." The latest incarnation of the Tokyo ensemble marks the completion of its new cycle of the complete Beethoven quartets with performances that adhere to the lofty standards set by the two previous installments in the series. Sensitivity and passion, verve and inwardness coexist happily in these probing accounts, which are captured in crystalline, well-balanced sound. This release follows albums of Beethoven's early and middle quartets, issued by the group between 2005 and 2009, and while the Tokyo's personnel differs from past lineups, the group has maintained great consistency of tone, superb technique, and refined expression since its founding in 1969. The same warmth of feeling and burnished sonorities that are characteristic of the earlier Beethoven recordings are still found here, and the added benefit of multichannel DSD recording gives the ensemble a heightened sense of separation and clarity, so anyone who is unable to find the older box set will be amply rewarded with these polished renditions. "Top Classical Picks for 2010"
"All the works, especially the slow movements, benefit from the Tokyo's lyrical engagement. These players also emphasize the counterpoint found everywhere; the two violinists, violist and cellist are often perfectly balanced so that we can hear every line with equal clarity." 3.5 (out of 4) STARS. "...still one of the great string quartets in the world... these performances of Beethoven's greatest masterpieces in the form are worthy to stand with any among their contemporaries."